1940, Janina Slarzynska and her five-year-old daughter Mira were taken by Soviet secret police (NKVD) from their small family farm in eastern Poland and sent to Siberia with hundreds of thousands of others. So began their odyssey of hunger, disease, cunning survival, desperate escape across a continent, and new love amidst terrible circumstances. The book is published by the University of Wisconsin Press. Superb Title and What an Odyssey! 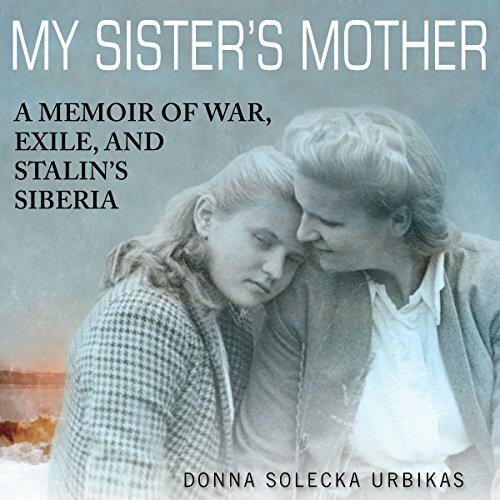 Donna Solecka Urbikas has masterfully captured the incessant stories of the exile and journeys during WWII and following years shared by her mother who seemed obsessed with making it known what had happened to her and her daughter Mira. The story blends the stories, later recorded memories of her mother and sister, bits of history of eastern Poland that Russia invaded in late 1939, the exile to work camps, life in refugee camps in so many countries, and rescue by a young Polish officer with a separation and reconnecting. The story and the distances covered by Janina and Mira offers insight to what happened to some of the Polish Catholics. The youngest daughter had the advantages of growing up and learning in American schools and witnessing the strong bond between the much older sister and mother with links to another world and time that the stories were insufficient to complete emotional bonds. With education, travel, employment, marriage and becoming a mother, the author encounters family illnesses and various issues that have lead to a better understanding and an emotional journey to write this excellent book that has been in the works for nearly 30 years. While I normally have had problems with books or movies that skip back and forth in time, the author has struck a really good balance with this style that seems to help with the character development and weaving herself into the story for the full impact of what WWII did to the lives of the people living then and the ones to follow. The narrator is phenomenal for this book. I hope people will visit the author's web site for more information. Also, I hope that some people might share at least some portions of this book with students.